The 88 Project, August 3, 2018: Tran Huynh Duy Thuc, a prominent political activist who has been serving a 16 years prison sentence since 2009, has been sending a lot of letters home, in which he shares with his family and friends his current conditions in prison and articulates his views on many matters of actuality and his vision for Vietnam. The letter dated June 26, 2018 updates his family on the most recent visit from the German Embassy and E.U. Mission in Vietnam, and affirms his wishes to continue the struggle for freedom and democracy from inside Vietnam, using the Vietnamese law itself. The 88 Project translates and publishes this letter as one of a series of letters Thuc sent home in July 2018, in order to share with a wider audience the beautiful mind and courageous spirit of one of the most beloved political dissidents in Vietnam. We ask for your continuous support for his case. 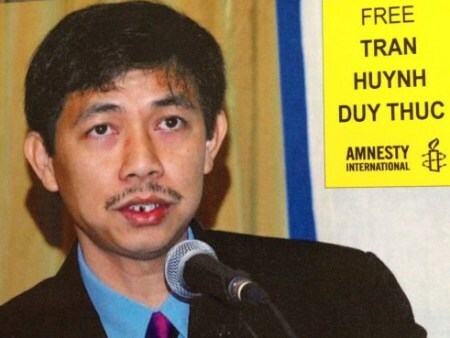 Please ask your government to pressure the Vietnamese government to release Thuc as soon as possible. More translations of his recent letters will be published in the coming weeks. On June 23, sister Sau and Quan came to visit and told me that you believe there is going to be a lot of big changes and that you will be well enough to wait for me to return home. I’m very happy. Yesterday morning, on June 25, a delegation of the European Union and the German Embassy based in Vietnam came to visit me. They were represented by a gentleman named Konrad in charge of political affairs at the German Embassy, a lady named Catherine in charge of political affairs of the EU Mission in Vietnam, and a Vietnamese gentleman named Dang who was introduced as an interpreter of the German Embassy (they spoke English and German). There were also supervisors and officers of the prison attending the visit. They listened with a good and open-minded attitude. They said they cared about my situation a lot and that was why they arranged this meeting. They wanted to know about my health situation, living conditions, and my wishes as well. I told them that my health was good and that my normal day would start by doing exercise, writing letters, composing poetry, music, and novels, reading newspapers sent by the family, playing the guitar, and learning Chinese. I also confirmed that I have no desire to go abroad. They told me they respected me and they also heard a lot about my spirit. They also said that it is rare to find someone who can follow such a schedule of activities in prison like I do. I told them that I was very happy to know that Lawyer Nguyen Van Dai was sponsored to go to Germany. As for me, I want to use my life to attract the attention of people to increase the respect for laws, human rights, and plurality. I believe there will be a lot of changes based on that spirit and I find that we are in the process of changing in that way. I understand the legal system still has a lot of problems, however, only in the spirit of respect for the law and of persistent demand for the improvement of the law, can the final change be great and desirable. I hope they will support us for such change. They said they understood and would keep a close eye on my case. They wished me well and hoped I have enough strength to make all my dreams a reality. They believed I can do it because I know how to use my time effectively. They affirmed that they would always keep following my case closely. After the meeting, they would contact our family to inform about the meeting and to discuss further about what was necessary. I thanked them and said that the meeting encouraged me a lot. The meeting lasted 60 minutes, as agreed between the German Government and the Vietnamese Government. They asked very carefully about the conditions of living, telephoning, mailing, and family visit… I answered honestly, telling them exactly what happened. They also asked about my eye problem as they had heard about it before. I told the truth that my eyes were not in very good condition because of the lack of adequate lighting, however this condition has been improving for over ten months. I also said that problems occurred sometimes but when I told the Board of Supervisors of the Detention center to protect my legal rights, they listened and resolved the problems according to the laws. The Delegation said that they were happy to hear that. They thanked their Vietnamese counterpart for creating favorable conditions for the meeting.